3 Days to Kill is a 2014 French-American action thriller film directed by McG and written by Luc Besson and Adi Hasak. The film stars Kevin Costner, Amber Heard, Hailee Steinfeld, Connie Nielsen, Richard Sammel, and Eriq Ebouaney. The film was released on 21 February 2014. The film received poor critical reviews and was a box office disappointment grossing $52.6 million against its $28 million. Experienced CIA agent Ethan Renner (Kevin Costner), originally from Pittsburgh, works with a team to capture the Albino, lieutenant to an arms trafficker called the Wolf, as he is selling a dirty bomb to some terrorists in a hotel in Belgrade. The Albino deduces the trap when he recognizes one of the agents (dressed as a chambermaid), whom he kills. Renner, suddenly dizzy as he pursues the Albino, only manages to cripple him by shooting him in the leg, then has a blackout, allowing the Albino to escape. Meanwhile, elite CIA assassin Vivi Delay (Amber Heard), a "Top Shelf agent", has been personally assigned by the Director to kill the Wolf. Vivi monitors the operation and suspects Renner has unknowingly seen the Wolf. Renner is nearly disabled by an extreme cough, which is diagnosed as terminal brain cancer which has spread to his lungs. He is given only a few months to live, and will not see the next Christmas. For decades he has kept his dangerous career a carefully guarded secret from his wife Christine (Connie Nielsen) and daughter Zooey (Hailee Steinfeld), at the cost of losing them. He decides to spend his remaining time trying to fix his relationship with his estranged daughter, and if possible, his ex-wife. He returns to Paris, where he and his family live separately, to find the Réunion family of Jules is squatting in his apartment. He is told by the police that he is not permitted to evict indigent squatters until after the winter. He makes an awkward reconnection with Christine, and tells her of his terminal illness. She allows him to reconnect with Zooey, and when she has to go out of the country on business, she agrees to let him look after Zooey. Vivi recruits him to find and kill the Wolf, in exchange for an experimental drug that could extend his life significantly. Renner reluctantly accepts, to get more time with his family. Vivi tells him the way to trap the Wolf is by getting the Albino, in turn by getting his accountant, in turn by kidnapping the gang's limousine driver. All the while Renner is fighting the hallucinogenic effect of the medicine, which occurs whenever his heart rate goes too high, and which he can only control by consuming alcohol. He must also deal with Zooey's school problems, including her habit of lying so she can sneak out partying. He manages to keep her out of trouble, and slowly reestablishes a father relationship with her, which impresses his wife. He tracks the Wolf and the Albino into the subway, but they gain the upper hand when he is disabled by the hallucinations. The Albino attempts to kill him by pushing him in front of an oncoming train, but Renner manages to push the Albino on the track instead. The Wolf escapes, then contacts a business partner who can help him to flee the country. The family is invited to a party thrown by Zooey's boyfriend's father, who happens to be the Wolf's business partner. Renner manages to protect Christine and Zooey, kill all the Wolf's men, and trap the Wolf in an elevator before breaking the cables, causing the cabin to free-fall to the ground. The Wolf survives, severely injured, but Renner is again disabled and, also feeling guilty for all the damage his work has done to his family, he's suddenly unable to pull the trigger, and drops his gun where the Wolf can get it. Vivi intervenes and kicks the gun back to Renner, telling him to finish the job and kill the Wolf, but he decides not to, because "I promised my wife I'd quit." Vivi then kills the Wolf. At last retired, Renner survives to Christmas, which he is spending at a beach house with Zooey and Christine. He discovers a small, red wrapped gift package, which contains another vial of the cancer medicine. Vivi is seen on a hill behind the house smiling as Renner opens the package. On 7 August 2012 Deadline reported that Kevin Costner had been offered the role of Ethan Renner, a government assassin in the McG-directed film. The film, set in France, was scripted by Luc Besson and Adi Hasak, with EuropaCorp having produced while Relativity Media has North American rights. On 2 October 2012, it was confirmed that actor Costner had closed the deal to star as lead in the film. On 29 November 2012, Hailee Steinfeld joined the cast of the film as female lead, and the film began production in early 2013. On 13 December, Amber Heard also joined the cast. Later, on 7 January 2013, Connie Nielsen was added to the cast. On 7 January 2013, crews were filming scenes in Paris and Belgrade, and shooting wrapped in April. Some scenes in Paris were filmed in the studios and in the central nave of the Cité du Cinéma, founded by Luc Besson in Saint-Denis. Scenes in Belgrade were filmed in front of Hotel Jugoslavija. On 31 January 2013, photos from the set of the film were released. In November 2013, stills from the film were released. On 17 December 2013, the studio released the first trailer and the poster for the film. On 30 January 2014, Relativity released a new Super Bowl 2014 spot. On 28 May 2013, Relativity set a release date of 14 February 2014 for the film. Later, on 30 October, the film's date was shifted back a week, to 21 February 2014. 3 Days to Kill has received poor reviews from critics. Rotten Tomatoes gives the film a score of 28% based on 108 reviews, with an average rating of 4.4 out of 10. The site's consensus states: "3 Days to Kill uneasily mixes technically accomplished action sequences with an underdeveloped family conflict." On Metacritic, the film has a score of 40 out of 100, based on 30 critics, indicating "mixed or average reviews" from critics. 3 Days to Kill grossed $12,242,218 in its opening weekend, finishing in second place behind The Lego Movie ($31.3 million). The film grossed a domestic total of $30,697,999 and a foreign total of $21,900,000, bringing its total gross to $52,597,999. ^ "3 DAYS TO KILL (12A)". Entertainment One. British Board of Film Classification. 2 May 2014. Retrieved 2 May 2014. ^ a b c Fleming Jr, Mike (6 August 2012). "After 'Hatfields & McCoys', Kevin Costner Eyes Jack Ryan, 'Three Days To Kill'". deadline.com. Retrieved 17 February 2014. ^ "Amber Heard Joins Three Days to Kill". movieweb.com. Retrieved 10 April 2013. ^ a b "Relativity Pushes 'Three Days To Kill' Opening Back A Week". deadline.com. 30 October 2013. Retrieved 18 February 2014. 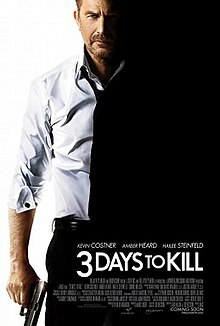 ^ "A violent '3 Days to Kill' falls off course". Pittsburgh Post-Gazette. Retrieved 20 February 2014. ^ Sneider, Jeff (2 October 2012). "Kevin Costner, McG set for Secret Service thriller". variety.com. Retrieved 17 February 2014. ^ Orange, B. Alan (29 November 2012). "Hailee Steinfeld Joins Kevin Costner for an Action Thriller from Director McG". movieweb.com. Retrieved 17 February 2014. ^ Sneider, Jeff (13 December 2012). "Amber Heard to 'Kill' opposite Kevin Costner". variety.com. Retrieved 17 February 2014. ^ a b Cunningham, Todd (7 January 2013). "Amber Heard, Hailee Steinfeld, Connie Nielsen Join Cast of Kevin Costner Thriller". thewrap.com. Retrieved 17 February 2014. ^ Dzodan, Neven (15 April 2013). "Costner feels fine in Belgrade". blic.rs. Archived from the original on 28 February 2014. Retrieved 18 February 2014. ^ Standal, Jeanne (31 January 2013). "First Look At Amber Heard & Kevin Costner In THREE DAYS TO KILL!". filmofilia.com. Retrieved 18 February 2014. ^ Hunter, Craig (8 November 2013). "New Images From McG's 'Three Days To Kill' Starring Costner & Heard". thehollywoodnews.com. Retrieved 18 February 2014. ^ Gallagher, Brian (17 December 2013). "Three Days to Kill Trailer Starring Kevin Costner". movieweb.com. Retrieved 18 February 2014. ^ Orange, B. Alan (30 January 2014). "3 Days to Kill Super Bowl TV Spot Starring Kevin Costner". movieweb.com. Retrieved 18 February 2014. ^ Rome, Emily (28 May 2013). "Kevin Costner movie 'Three Days to Kill' gets release date". ew.com. Retrieved 18 February 2014. ^ "3 Days To Kill". Rotten Tomatoes. Retrieved 5 July 2014. ^ "3 Days to Kill Reviews". Metacritic. CBS Interactive. Retrieved 26 October 2014.